There was a time when we listened to music in our living rooms. Out loud. That enjoyable experience is making a welcome return because it is fun and because of advances in digital technology. Traditional stereo receivers seem almost quaint these days. Speakers with built-in amplifiers are becoming the leading edge in home music appreciation. Elvis Costello once said, “Writing about music is like dancing about architecture. It’s a stupid thing to try to do.” Read on, you’ve been warned. Each speaker contains a silk dome tweeter and a patented 5-1/4 inch XBL aluminum-cone woofer on the front with a matching passive radiator on the rear. If you stand close to these speakers, you can feel the music viscerally. You will be surprised at some of the extraneous sounds these speakers will reveal: breathing, page turns, orchestra shuffling. I have a Haydn symphony underneath which I can hear the low rumble of a truck passing outside the studio. Transparent One contains a built-in 60 Watt per channel amplifier with an embedded DSP (Digital Signal Processor). The Vanatoo engineers have matched the input signal to the speaker drivers. 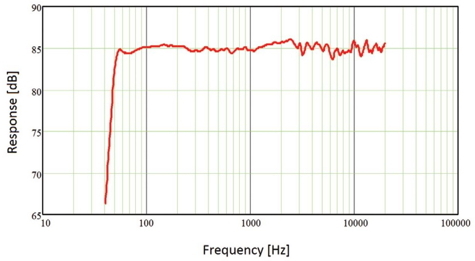 This results in nearly flat frequency response. This matching of the amplifier to the drivers is one of the reasons that the Transparent One sounds so clean. The chart below shows the flatness of the signal after DSP processing. During my testing, I experimented with speaker placement: various distances from a wall, raised to table height, and in a bookcase. Waist high, slightly away from a wall seemed best. Built-in bass and treble controls are available for compensation depending on the placement you choose. 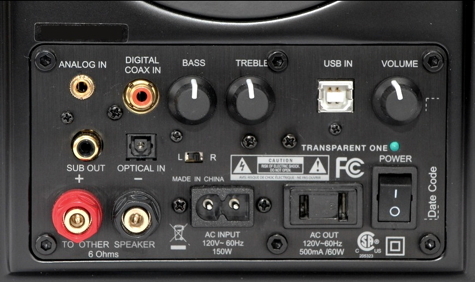 AC power connects only to the speaker containing the amplifier. The two speakers connect to each other with speaker wire. There is a convenient left/right switch to match your placement. The speakers can be connected in an impressive number of ways. (See below.) I experimented with all of them except Coax digital. The best connection for me was a Toslink optical cable connection from an Apple TV via AirPlay. That makes an unbroken digital connection with song selection and volume controlled remotely from your iPhone or iPad. A line-out connection from a CD player or turntable requires preamplification. Vanatoo has an optional Avantree Roza 4.0 Bluetooth adapter available for Bluetooth support for $34.00. It’s only 2-1/4 inches (57mm) wide. It is powered by the AC outlet on the back of the speaker and connects via a 3.5mm-to-3.5mm cable. Bluetooth is an evolving technology that doesn’t yet transmit the sound quality that these speakers are capable of reproducing. The audible deficiencies of Bluetooth are obvious when an A/B comparison is made against a direct digital connection. The solidly built Transparent One speakers weigh in at a hefty 23 pounds. (10.4kg) The 5-1/4 inch aluminum-cone woofers with their massive magnets are responsible for much of that weight. The boxes are sturdily constructed of thick 3/4 inch MDF with cherry veneer. The Vanatoo Transparent One is a true audiophile speaker system. It is expensive but if you are a serious listener and music addict, you will not be disappointed. For solo listening it is superb, and off-axis listening with a group of friends is still very enjoyable. Vanatoo generously offers a 30-day return policy with free shipping. It’s a low-risk move on their part because once you listen in your own surroundings, you’ll be hooked. 60 watts per channel D2 Audio Class D amplifier. Maximum Sound Pressure Level (SPL): 95dB in typical room conditions. Inputs: Analog (3.5mm), USB digital, Toslink optical digital, S/PDIF Coax digital. Digital Inputs: 96K bits per second sample rate, 24-bit depth. Left/Right switch for positioning convenience. After giving the Transparent One a thorough workout on my own, I got together with two MyMac reviewers. Both reactions were similar on first hearing them—a sharp intake of breath. We listened to symphonic music, pop, opera, piano, rock, and even some harpsichord. We detected a slight treble roll-off at the very top end of the spectrum but that was adjustable with the Transparent One’s treble control. Vanatoo may have generated another sale or two as a result of our experience.